Yuna Kim Sheds Tears After Hanging Up Ice Skates | Yuna Kim | Just Jared Jr.
Yuna Kim wipes the tears from her face during a press conference after her farewell ice show held at Olympic Gymnastics Stadium on Tuesday night (May 6) in Seoul, South Korea. The 23-year-old Olympian skated her last show at the stadium and hung up her competition skates. 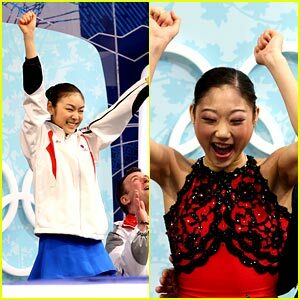 Yuna took home the gold medal in ladie’s figure skating during the 2010 Vancouver Winter Olympics and the silver at the 2014 Sochi Winter Olympics. God Bless and Best of luck! No person on this planet has brought me more tears of joy than you. You are and always will be my queen on the ice, forever.